Over the past few years, the desire for decorative mirrors has overshadowed the need for medicine cabinets with attached mirrors, which caused many homeowners to lose storage space. According to the National Kitchen and Bath Association (NKBA), 66 percent of its members have included these furnishings in their washrooms this year, up from 36 percent in 2011. While an oversized mirror may work in larger bathrooms, those who have limited space should use these furnishings to their advantage. A medicine cabinet is a great place to store medications, soaps and other bath products and help spare the counter of your bathroom vanity from becoming too cluttered. In the spirit of saving space and keeping your bathroom accessories out of sight, consider investing in a linen cabinet to go along with your medicine cabinet. Mirrored storage is an attractive way to set up your bathroom, so place one on either side of your vanity to have plenty of space to store towels, washcloths and other linens. If you're sick of that massive mirror in your bathroom, a medicine cabinet with a mirror could be a great way to de-clutter your washroom. 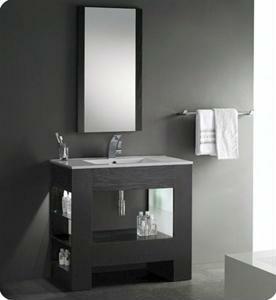 What small furnishings do you suggest for those looking to improve their bathroom storage space?